In just a few weeks I've gone from someone who avoided any and all body oils (and even body lotions, such a faff) to someone who can't get enough of body oils! Where have they been all my life?! 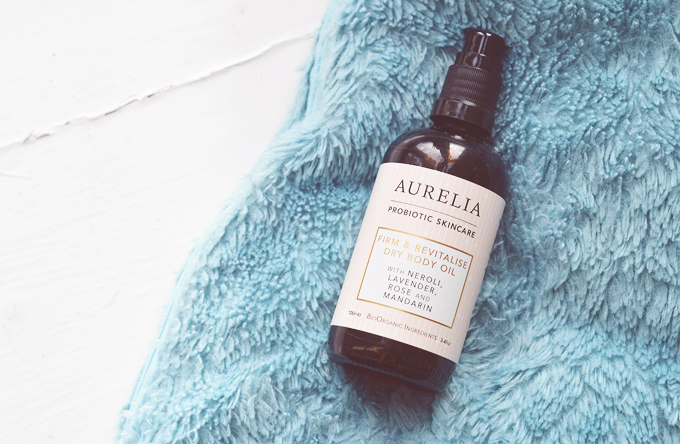 It all changed the moment Aurelia's Firm & Revitalise Dry Body Oil* arrived a few weeks ago. Now I never really understood what a dry body oil was before, how can an oil be dry? It just made no sense to me at all, simply because I'd never tried one. If you never have either then the best description I can give is that this oil is not greasy, not at all. It's more like a liquid than an actual thick oil, sinking into skin at the speed of light. Even speedier when skin is damp. I just applied a drop to my arm to help describe the scent, I'll be honest and say it's not the most beautiful scent in the world, but that's just my opinion because I'm not much of a rose fan, but it is pretty lovely & has grown on me a lot, probably because I love Lavender so much. It's strong, even just from a drop I can smell it clearly. Think floral but not flowery. The essential oils blend together really well to create a cohesive, calming scent that makes this an essential after a nighttime shower. I try to remember to take this into the bathroom with me when I go for a shower, so that I can easily apply it to damp skin at the end and I'm good to go. However I do often forget to take it with me and apply it a little later on, hoping my skin is still a little damp. This is where the beauty of the dry oil comes into play as it really doesn't matter if my skin was damp or not, it's still sinks in so easily, there's so greasy feeling, no tackiness or residue left behind, I can put my PJ's on without waiting about freezing to death. Thank you, Aurelia. The ingredients include macadamia, peach and kukui oils, plus watermelon seed oil, one of my favourites. I was a little concerned that the first ingredient was coco-caprylate but after a quick look on the cosmetic skin database discovered it has a rating of zero (that's good) and is a coconut alcohol, which I assume is what makes this oil dry. Either way it's certainly making my skin feel incredibly soft... what winter? I also have to point out the simply beautiful, classic Aurelia packaging, a brown glass bottle and their peachy pink label with golden accents, it certainly looks as expensive as it feels. What's more I've been using this an awful lot and am only just level with the top of the label so I feel it's going to last me a long time, hopefully all of winter. I use about 1 pump of oil per limb, though the pump is a little fussy and needs an update as it can leak a tiny bit, but it's not the end of the world. All is forgiven when your skin is that soft and you're smelling good, am i right?! Have you tried Aurelia Skincare? I have not tried this brand yet, but this sounds lovely. As a fellow blogger, I'm always looking for brands to try. Thanks for sharing!